If I have one criticism of my brain, I'd say it's not very good at being quiet. This isn't a problem during the day but I'd like it to be a bit calmer at night please. I've not been a good sleeper since my mid-twenties, and I'm always looking for ways to silence my mind. When I was at university I went to meditation classes for a year or so, but I only ever got to that special, pre-enlightenment place a couple of times. Each time it happened, another part of my mind would suddenly shout "hey look - it's working!" and ruin the moment. The only real awareness that came to me was that the leader of the class seemed to be building himself a cult, and so I stopped going. 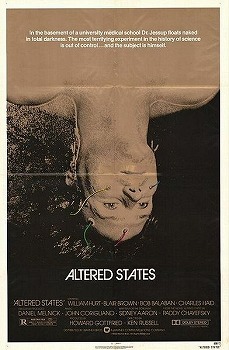 When I was a kid I watched Altered States, a 1980 Ken Russell horror film about a researcher who takes hallucinogens in a flotation tank and regresses to a more primitive form of humanity. The film is pretty bad (I watched it again last December), but I've always wanted to try a session in a flotation tank to see how it feels. Flotation tanks were invented in the 1950s by John C Lilly (worth a click just to see his hat! ), an American scientist who researched sensory deprivation and human conciousness. He took a lot of LSD and was also the first scientist to communicate with dolphins. As far as I can tell he never took LSD in a flotation tank with a dolphin, or at least he didn't document it. It turns out that Cornwall's only flotation tank is in Par, a few miles down the road. My first experience was very pleasant. The tank is about 3m x 1.5m and the water is about 50cm deep. It's a strong salt solution which makes you very buoyant and float. I knew from a trip to the Dead Sea that it would sting my eyes, and they recommend covering any open cuts with vaseline. The water is the same temperature as your skin, and the air is the same temperature as the water, so after you get settled down and the water stops moving about it's hard to tell which bits of you are exposed to the air. It's also dark and they supply earplugs to enhance the sensory deprivation. For the first fifteen minutes my mind was racing, thinking of things I'd done that day or tasks I had to complete. Eventually my mind started slowing down and I just enjoyed the feeling. A couple of times my mind went into pre-sleep mode, where my inner monologue stops and my thoughts are purely visual, often with strange and abstract scenes that I can't easily articulate. After about 45 minutes I came back round to full conciousness. showered and spent the recommended 15 minutes in the relaxation room. On the drive home I felt light, refreshed and calm, like I'd been asleep for a few hours. This feeling stayed with me for the rest of the day. I found myself looking forward to the next session, a week later. I'd had a really busy morning, and I just couldn't get in the zone. It was very pleasant, but my brain chattered away the whole time and I only briefly got to be properly relaxed during the 45 minute session. After climbing into the tank I had the usual brain chatter for 10 to 15 minutes, then I zoned out and everything became quiet and still. Really quiet, my brain was actually silent for the first time I can remember since I was an adult. In addition, I couldn't feel my body, like it had been removed. I felt like I was just my brain and airways, breathing, floating in a black void. It was a beautiful feeling that lasted maybe ten minutes. It was followed by a series of semi-dreams each lasting no more than a minute. Surreal images with no language, for example a spinning piece of wood with a small toy head embedded in it. There was no meaning to any of them that I could discern. Then finally a release into a calm, crystal clear thought space that I've only ever glimpsed before. My thoughts were colossal, universe-scale, about the meaning of life and my purpose in the world. If I believed in God I'd call it a religious experience. All these thoughts came from within me, I'm not suggesting they were external. I think it was my sub-concious mind communicating clearly with my concious mind, in a way I've never experienced before. On the way home I was buoyant and optimistic in a way I haven't been in ages. And that feeling stayed with me for several days before fading gradually. I've booked in some more sessions, I want to see where this goes!